For most of the people, the popping acnes on your facial skin can be an irritating moment that ruins your perfect appearance. Particularly, the moderate to severe inflammatory acne will need a stronger treatment like with antibiotic therapy. When you look for acne medication, some of the doctors may recommend using clindamycin for acne treatment. 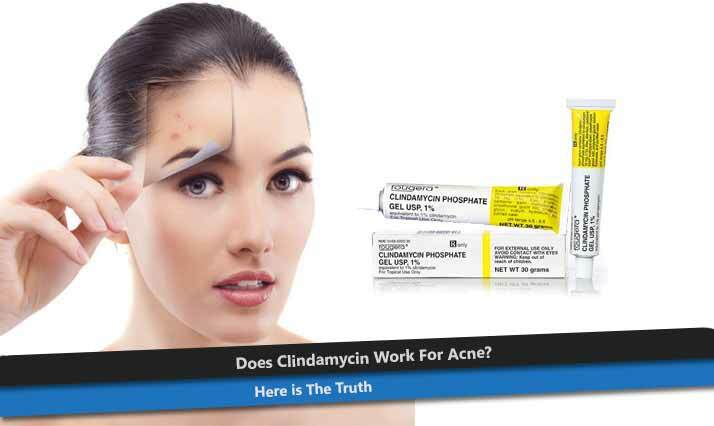 Does Clindamycin Work For Acne? Clindamycin is one of antibiotics medication to fight against bacteria and help decrease inflammatory acne. However, most of the studies recommend should not use this topical antibiotic as a treatment for acne. According to American Academy of Dermatology, the use of topical antibiotics can be associated with a greater risk of bacterial resistance. Therefore, it should be taken with other topical or oral medicines for acne. Commonly, the combination of clindamycin with benzoyl peroxide is an effective acne treatment as topical therapy. You should know that applying topical clindamycin can’t cure your acne right away. It only helps to keep your acne under control. Doctors will recommend taking the therapy for the full time of treatment. Although the symptoms begin to vanish, you should take it after a few days, in some cases you even need to continue for months or longer. For the side effects, some people may experience dryness and mild irritation on their skin after the first time using the products. In the rare cases, there are those who get abdominal cramps, diarrhea, fever, nausea, vomiting, weakness, and weight loss. The medicines also may not suitable for certain conditions like pregnancy, allergic, children under the age of 12, or others. Wash the affected areas of your skin with warm water and antibacterial soap. Rinse thoroughly and dry it well with a soft towel before start applying clindamycin. For men, wait for 30 minutes after shaving before applying the medicine. Apply the medicine on your fingertips and then cover the pimples lightly. You can also apply it to the areas which usually affected by acne to prevent new pimples from breaking out. Unless you have an oily skin, you should wash your face with the soap for 2-3 times a day as instructed by your doctor. Washing the affected areas of acnes too often will cause your skin to become dry and worsening the acne. For women, you can continue to apply make-up after using the topical clindamycin. However, it’s recommended to avoid use heavy or too long make-up yet use only water-base cosmetics. Summarily, clindamycin is one of the most common antibiotics prescribed for acne. Although it doesn’t directly work curing your acne, it helps prevent the inflammatory acnes worsen and keep it under control. However, ensure to consult with your doctor before use the products to avoid any allergies or if you experience those unwanted effects afterward.